Some content marketers think about using templates like the herb cilantro. They either love it or hate it. But the extremes of love and hate present some issues. Those who love templates too often fall under the category of “quick fix” content marketers. They get excited about a gimmick or formula and implement it without much of their own research. And those who hate templates too often fall under the category of “hot mess” content marketers. They — dare I say it — create content that is too original. The kind that is difficult to understand and does not resonate with their target audiences. The right amount can greatly improve the content’s flavor. Here is a three-part plan to help you benefit from using templates. A template should be a powerful teacher. When you come across an influencer outreach email outline or a popular blog post format, study why the template appears to be effective. How does it help you achieve your objective? The essence of a standard influencer outreach email might encourage you to first get to know the person you’re going to email more personally. That requires time, effort, and patience. You might post thoughtful comments on their blog or intelligently reply to their social media updates. Then, when it’s time to send your email, your established online relationship with them will help you stand out. If you’re going to write how-to articles or list posts, figure out how those compositions can help you provide useful experiences that will grow your audience. You likely want to create content that is similar to your favorite publishers’ work. You connect with their voices and you want your audience to connect with you in the same way. Your favorites can guide you, but you obviously don’t want to copy them. That is why writers always emphasize the importance of practice. Your own winning content marketing depends on your own creativity. Finding your own style is a continual process because you’re constantly evolving as a person as you evolve as an artist. My work five years ago prepared me for the work I’m doing now, and the work I’m doing today is preparing me for the future as well. It never ends, so rise to the challenge. This is sort of a sneaky step in the three-part template plan because it requires that you go back to Part One, as needed. As you keep fine-tuning your approach, there might be more for you to learn from a certain template that you overlooked when you were just starting out. Content marketing is also quite experimental, so once you have some experience, there might be new templates for you to explore that you hadn’t considered earlier on in your journey. The most successful content marketers have studied essential conversion models while simultaneously expanding the definition of smart content with their innovative work. You have to have faith in your own ability to also do just that. 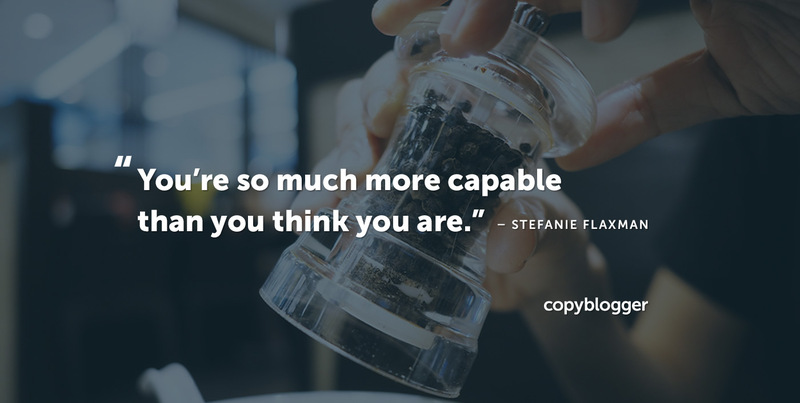 So when self-doubt creeps in (and it happens to all of us), remember that you’re so much more capable than you think you are. Go get your pepper grinder. Previous article: Are You Making These Authority-Crushing Mistakes with Your Content? Really good points here, I feel like I constantly bounce between ‘quick fix’ and ‘hot mess’ and it can be hard to find a balance. Thanks for breaking this down!